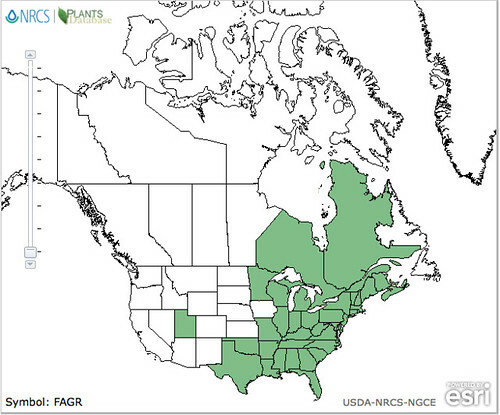 Dangers: beech nuts contain small amounts of oxalic acid and a few other compounds with minor toxicity.Small amounts of the nuts can be eaten raw but larger quantities should be roasted to remove the compounds. Beech nuts ready to eat but still in husks (fall). 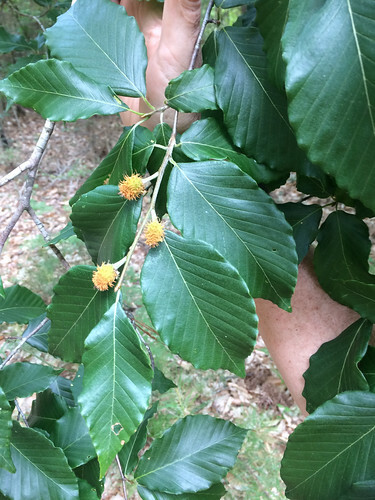 When walking through East Texas woods always be on the lookout for the fantastic beech tree. They are definitely uncommon to almost the point of being rare but a well-trained eye will likely find one. Beech are kind of strikingly ordinary trees. Their gray, relatively smooth bark white occasional splotch of white lacks the craggy coolness of oaks. The alternating, slightly ruffled, dark green leaves rarely call attention to themselves. 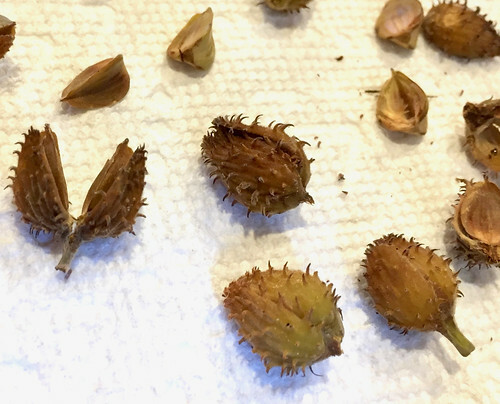 During most of the summer and even fall the beech nut husks can easily be mistaken for acorn husks by novice woods roamers. 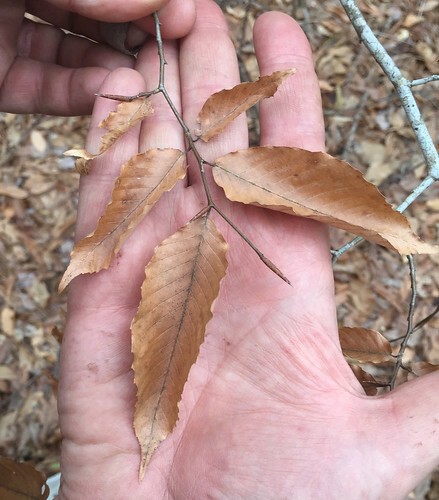 The most likely time a beech tree will stand out is in early to mid winter when the surrounding deciduous trees have lost most of their leaves beech beech leaves will have turned tan/brown but will be clinging tenaciously to the tree, giving it a big ball of tan color among the winter grays. In later winter/early spring the new beech leaves make a find salad green. 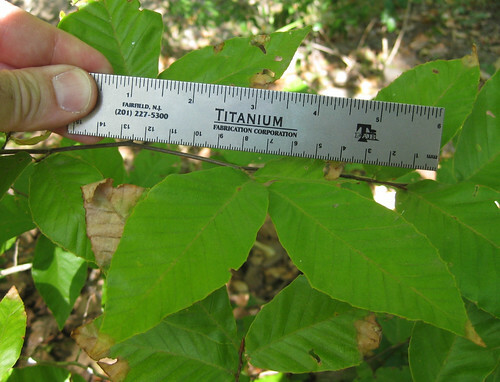 Be sure to use a pruning shears to harvest the leaves so as to minimize the damage to the bark, a common entry point for tree-killing fungi. 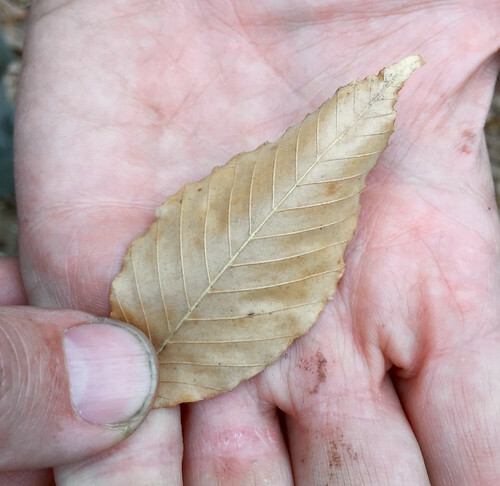 I'm told the young leaves can be soaked in a mixture of brandy and gin for a few weeks to make a liquor called Beech Noyau. Unfortunately I haven't been in the presence of a beech at the right time to gather leaves for this drink. 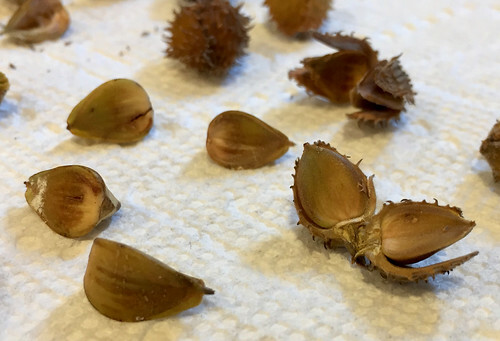 The nuts spend most of their time completely encased in a somewhat spiked husk which doesn't split open until fall, if ever, to reveal the single, three-sided nut inside. After removing the outer husk there's a second, inner sheath encasing the nut that should be peeled off before eating. 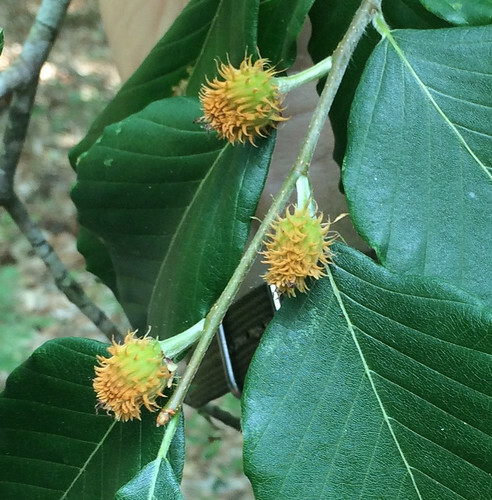 Beech nuts are loaded with fats which make them an excellent source of calories in the woods. As mentioned at the top of this article, it's best to roast beechnuts if you plan on eating a lot of them. Think of the inner layer of bark (cambium) of beech trees as emergency oatmeal. To eat this inner bark, peel it as thinly as possible and then let it dry. Once dried, chop it up into flakes which are usually pounded into a low-grade flour or boiled like oatmeal. The flavor is on par with that of boiled paper but it will give you calories. Remember to harvest the inner bark from strips running lengthwise on branches rather than from the stem so as to minimize "tourniqueting" the sap flow, killing the tree. 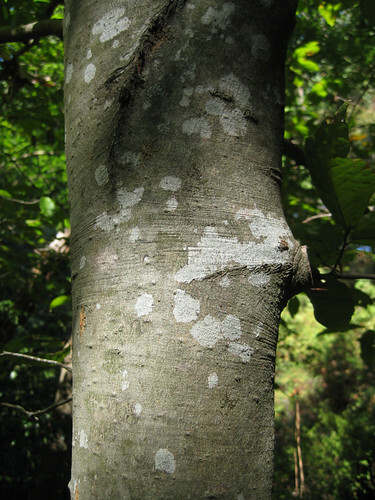 The inner bark can be harvested all year long.